It was a great process for me. I felt so supported the entire way, like this family came around me and helped me every step of the way. April Lyons started her private practice in Boulder in September 2014. She had already worked as a counselor for children, eating disorders and post-traumatic stress disorder (PTSD) in a variety of professional venues, but she was facing high competition in Boulder. The Boulder therapy market is one of the most saturated in the US, with many talented therapists bringing a variety of cutting edge modalities to the field. April understood that to break into the Boulder market and grow a new practice on primarily private-pay clients, she would need a strong and direct approach to her online presence and marketing. After just six months, her collaborative and strategic work with CounselingWise has allowed her to build a recognizable and profitable practice in one of the nation’s toughest therapy markets. April was committed to establishing her new practice in the competitive Boulder marketplace. There were a few steps she knew she should take to boost her presence and client base immediately – like creating a Psychology Today profile and signing up for insurance panels. But when April applied for panels, every single one said they were full; the market in Boulder was simply too crowded. She knew that she would have to make her practice work with private pay clients, but, surrounded by so many established, recognized practices, there weren’t any easy clients coming her way. April hadn’t created a website before, but she knew how important a strong online presence would be if she wanted to build a successful practice. And, understanding how saturated the therapy market was in Boulder, she knew she would have to find a way to stand out. I really feel like my website has been such a great referral source for [clients]… People were finding me through Psychology Today or other referrals, but they said when they saw my website they felt like they knew me. April was committed to the process of building a rich, informative online experience that would drive organic growth, but ranking in such a competitive market takes time. She knew she needed a strategic marketing approach if she wanted her practice to survive in the short term. When April first started with CounselingWise, she was committed to the process of building her online presence. She wanted a well-designed, effective site that clients could find, and she wanted to write her own content. April knew she would need help staying accountable throughout the complicated, two month process. Additionally, she wanted someone who could edit her writing and offer guidance as she placed herself in her clients’ shoes to write from their perspective. 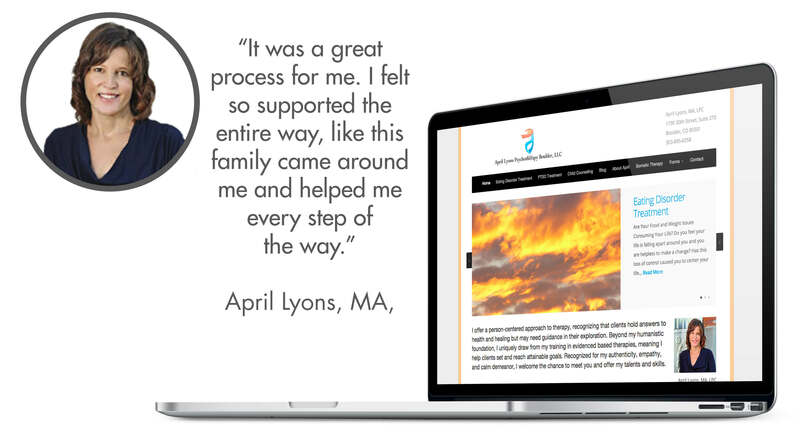 And so, following the advice of a colleague who had previously worked with us, April reached out to CounselingWise for help establishing her practice’s online presence and growing an initial client base in Boulder. Throughout our work together, we provided a variety of training modules and examples that made the writing process easy for April. These videos and samples explained how to write the various pages she would need in a way that related to clients and would allow her to rank in online searches. Whenever she completed a page, her editor not only revised content, grammar and flow, but helped April dive deeper into the solutions she provides and speak directly to the client through her website. Her project manager provided immediate answers and feedback, helping April stay calm, confident and on track throughout the site design and launch process. In such a competitive market, ranking on the top of page one would take time. We had helped build a strong foundation for April’s business, but she needed a strategy that would bring in clients in the short-term. So, while her website content and SEO continued to climb the Google search rankings, we developed and launched a strategic, targeted AdWords campaign. We provided April the tools she needed to review and understand the AdWords campaign analytics, which allowed her to tailor her content to mirror the way potential clients are searching. I said I wanted [AdWords] on the 13th and it was up on the 16th. I gave some information on a short form and I was up and running. It worked right away with no problems. After six months of working with April Lyons, her client base doubled. By approaching her online presence strategically – and considering the competitive market she was entering – we were able to move two of April’s three specialties onto page one of the search results, including “eating disorder treatment Boulder” and “PTSD treatment Boulder.” Combining this organic growth with the use of a targeted AdWords campaign, April received 13 phone calls in a single month and booked seven client consults in one day. In a saturated market overflowing with therapists, April was able to use her online presence to carve out a niche for her own private practice. She has increased her client base and income, creating a self-sustaining practice in a brimming marketplace, with the tools and resources she needs to continue to thrive throughout her time in Boulder. Find someone you can trust who can help you, like I did with CounselingWise and Becky. I feel like [they] offer every single dimension of this whole process. If you are interested in learning more about how you can attract and convert clients and thrive in a crowded therapy market, we invite you to contact us today.